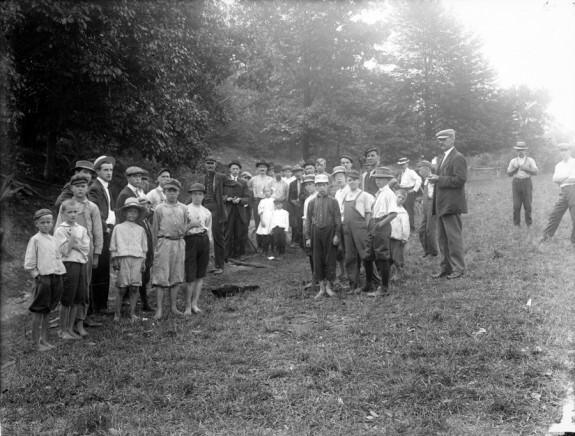 About two thousand members of the Coatesville community participated in the lynch mob that burned Zachariah Walker in a field on August 13, 1911. Members of the mob gathered pieces of wood and forced Walker to remain in the blaze as he attempted to escape. After the fire burned out, some of the men, women, and children who watched the horrific event scavenged for Walker's remains to take as souvenir. This photograph was taken the morning after the lynching, as a crowd of community members formed at the site of Walker's death to view the remnants of the event. Lynching, the extralegal killing of a victim by individuals or a mob, notably by hanging or burning, was commonplace in the United States at the turn of the twentieth century. Though accounts vary, in the heyday of lynching following the Civil War, at least 3,500 incidents were recorded; more than 80 percent occurred in the American South and targeted African Americans. Though less frequently, lynchings also occurred in Pennsylvania, Delaware, New York, and New Jersey. Two of the most sensational incidents occurred in Wilmington, Delaware, in 1903 and Coatesville, Pennsylvania, eight years later. In an incident dubbed by newspapers as the “Delaware Horror,” in June 1903 a mob watched as African American farm laborer George White burned alive on the outskirts of Wilmington. Accused of having assaulted a teenage girl and leaving her to die, White was kidnapped from the New Castle workhouse and returned to the site of his alleged crime as an angry crowd jostled for position. His plea for help—“Mercy, Master, Mercy”—went unaided and afterwards spectators retrieved souvenir body parts. Philadelphia newspapers provided ample coverage of the episode and the efforts of local civil rights activist and A.M.E. pastor Montrose Thornton to hold the guilty accountable. They also published dozens of letters both praising and condemning the mob action. Like the one previously recorded racial lynching in Delaware (near Smyrna in 1867), no one was ever prosecuted. The Wilmington lynching was one of a half-dozen barbaric “spectacle lynchings” that occurred across the North in 1903. In retrospect, the Wilmington lynching has eerie similarities to events in Coatesville eight years later. 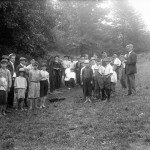 On Sunday evening August 13, 1911—“that quiet Sabbath evening,” W.E.B. Du Bois (1868-1963) wrote scornfully—an estimated two thousand people watched as Zachariah Walker was burned alive in a field just outside Coatesville, Chester County. Walker, a newly arrived African American laborer from Virginia, worked at the Worth Brothers Steel Company. He was accused of killing a popular white security guard in what might well have been an act of self-defense. As teenage boys piled more wood on the fire, Walker pleaded with his captors, “Don’t give me no crooked death because I’m not white.” When the deed was done, scores of people waited hours to retrieve souvenirs from the flickering embers. The Coatesville lynching typified the well-orchestrated mob execution that historian Michael Pfeifer has summed up in the phrase “rough justice.” Like George White in Delaware, Walker was not afforded due process, and the formal administration of justice broke down completely. Chester County juries found the alleged perpetrators not guilty, and crowds cheered when the men and teenage boys emerged from the county court house in West Chester. Despite evidence, in both cases no one was convicted of a crime. The most unusual characteristic of the Coatesville episode (and Wilmington, too) was its geographic setting beyond the American South. Coatesville was a prosperous northern steel town, and a community in the throes of significant social and economic change brought on by rapid industrialization and the sustained in-migration of both European and southern Black laborers. Racial and ethnic tensions were at their height in a borough already layered with deep class divisions. Much to the dismay of civil rights advocates like Du Bois, Ida Wells-Barnett (1862-1931), and T. Thomas Fortune (1856-1928), the Wilmington and Coatesville incidents were reminders that mob violence every bit as vicious as the worst southern atrocities could occur beyond the old Confederacy. Lynchings were often underreported, and attempted lynchings, including two later incidents in Coatesville, often have been ignored in the history of racial violence. While accounts vary, African Americans were victims in six of the fourteen recorded lynchings in Pennsylvania history. Eight of the estimated ten lynchings in the rest of the mid-Atlantic region included black victims. Though the total number of northern racial lynchings ebbed with the rise of organized resistance, the spreading pall of twentieth-century urban rioting in Philadelphia, Wilmington, Newark, and elsewhere, served as a reminder of racial violence as a persistent social reality. The memory of lynching also persists. In the early 1990s a prominent resident of Coatesville proudly displayed to a historian a self-igniting miniature scaffold he had manufactured in homage to the lynching. And in January 2000, a white resident of the Juniata Park section of Philadelphia was convicted of the crimes of ethnic intimidation and assault for placing a makeshift noose around a black co-worker’s neck. Although not as well publicized as the case of the Jena Six in Louisiana (2006), the incident in Philadelphia, like the scaffold, was another reminder of the insensitivity, blatant prejudice, and conflicting social fears that underlay the gruesome legacy of lynching and racial intimidation in the United States and the Greater Philadelphia region. Dennis B. Downey, Ph.D., is Professor of History and Director of the University Honors College, Millersville University. With Raymond M. Hyser, he is the author of ‘No Crooked Death’: Coatesville, Pennsylvania, and the Lynching of Zachariah Walker (Urbana: University of Illinois Press, 1991; reprint 2011). Downey, Dennis B., and Raymond M. Hyser, ‘No Crooked Death’: Coatesville, Pennsylvania, and the Lynching of Zachariah Walker. Urbana, Ill.: University of Illinois Press, 1991; reprint 2011. Downey, Dennis B. “ ‘The Delaware Horror’: Two Ministers, A Lynching and the Crisis of Democracy,” in Michael J. Pfeifer, ed. Lynching Beyond Dixie: American Mob Violence Outside the South. Urbana, Ill.: University of Illinois Press, 2013, pp. 237-260. Pfeifer, Michael J. Rough Justice: Lynching and American Society, 1874-1947. Urbana, Ill.: University of Illinois Press, 2006. Historical Marker, “The Lynching of Zachariah Walker,” Route 82 South, about one-fourth mile from Coatesville city limits. In the 19th century, “lynching” meant extra-judical punishments which could very greatly in intensity. In 1840, Daniel Neall of Philadelphia, who had been the major figure behind the construction of Philadelphia Hall, which was burned by a mob in 1838, just after it had opened, was accompanying Lucretia Mott of Philadelphia in her travels in the ministry in Delaware. Somewhere near Smyrna, Delaware, has taken out of the house that he was staying in, ridden on a pole and then tarred and feathered. Lucretia Mott followed the mob telling him that she was the one they were after. Neall’s tar and feathering tuned out to be largely symbolic, with the tar dabbed onto his clothes and the feathers adhering to the tar. A tar and feathering could be lethal, or at least exceedingly painful, if it was hot tar poured onto a naked body. None of the mob stepped forward to explain why they targeted Neall, but but various newspaper accounts where clear that the lynching was connected with abolitionism and/or Neall speaking with African-Americans. I find the targeting of Neall as a little curious as though he was an abolitionist, he was neither a speaker or writer and did not have great public visibility. A possible answer is that he was from Delaware himself, and was the son in law of Warner Mifflin of Delaware, a noted anti-slavery figure. One of his daughters later married Sidney Gay of New York, another abolitionist. Whether the lynching was largely symbolic, or stopped short of being lethal, or was lethal, the message was that there was a supposedly large population who were not afraid of openly not going through the law or public authorities, to dispense what the lynch mob considered the will of the people. The victim virtually always had no way to seek redress in the law. There was no way that Daniel Neall or Lucretia Mott could have judged the intentions of the lynch mob. Perhaps they intended more than they delivered, deterred by a little (less than five feet tall, and less than ninety pounds, old (by the standards of the day) Quaker lady who kept tell them that if anyone was the guilty party, it was herself, Lucretia Mott of Philadelphia.